The U.S.S. Enterprise is sent to the territory of the xenophobic Melkotians to attempt to make peaceful contact with the mysterious race. Captain Kirk (William Shatner) ignores a warning buoy and takes the vessel into Melkotian space. 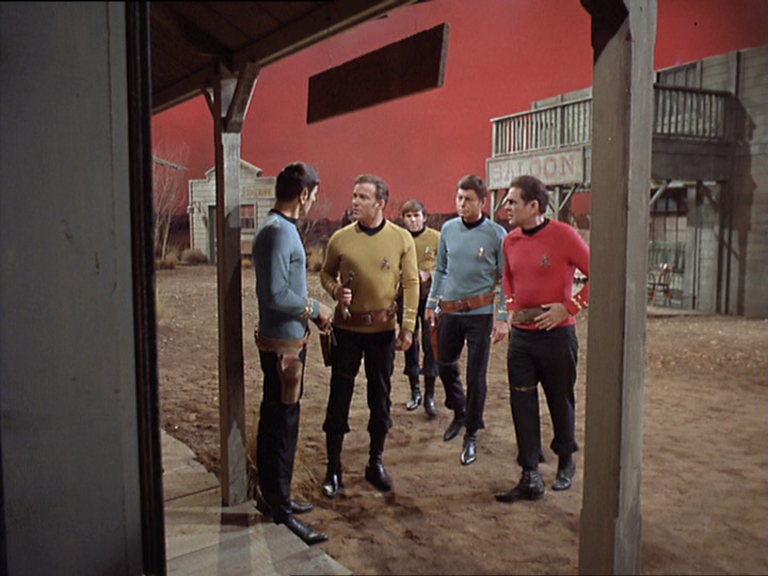 After beaming down to a Melkotian planet, however, Kirk and his landing party -- which consists of Mr. Spock (Leonard Nimoy), Dr. McCoy (De Forest Kelley), Mr. Scott (James Doohan) and Mr. Chekov (Walter Koenig) -- confront a Melkotian who plans to terminate the intruders using their own primitive thoughts. In particular, the thoughts of Captain Kirk will be the “pattern” for their deaths. 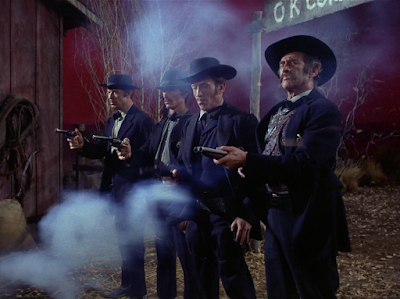 In a flash, the Enterprise landing party finds itself trapped in a bizarre, half-formed recreation of Tombstone, Arizona, circa October 26, 1881, the day of the gunfight at the OK Corral. This is a facet of Kirk’s family background and history: The Old West. Worse, all the denizens of this world see Kirk and his team not as Starfleet officers, but as a criminal gang of the day: the Clantons. And, unfortunately, history records that Wyatt Earp and his brothers killed the Clantons that very day. This is a fate that seems inescapable. To wit: Kirk attempts negotiation with the Earps, and fails. He attempts to leave the town with his crew, only to be repelled by a force field at the town border. He even attempts to seek the aid of a local lawman, with no positive results. Soon, one of the Earp brothers murders Chekov in cold blood, and this tragedy gives Spock a valuable clue. Chekov’s “character,” Billy Claiborne, survived the OK Corral combat, so it is possible that history can be changed. Using his Vulcan mental abilities, Spock is able to pierce the powerful Melkotian illusion with the power of his mind, so he and his shipmates will be prepared for the gunfight at the OK Corral. I know my view about this Star Trek episode is not a popular one, but conventional wisdom be damned! “Spectre of the Gun” is one of my all-time favorite Star Trek (1966-1969) episodes, from any season. I also consider it one of the absolute best installments of the third season canon. The episode is widely disliked by some Trek scholars and fans for two reasons, both of which I’ll explain below. I fully understand both reasons, even if I don’t agree with them. The first reason involves TV history, and the nature of television in the 1960’s. This was the age of Gunsmoke (1955-1975), Bonanza (1959-1973) and other popular Westerns. In short, Westerns were everywhere, and they were the norm. You couldn’t turn on the TV to escape them. And, in fact, Star Trek was even considered a respite for audiences tired of horse operas. 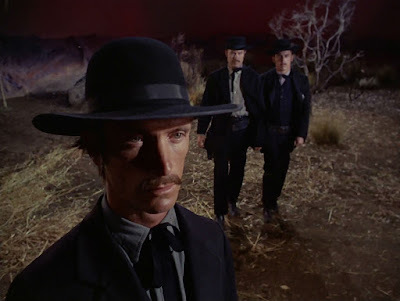 So fans look at a “Western”-themed episode of Star Trek -- a series that was sold to NBC as “Wagon Train to the Stars” -- and see only a sell-out; a bow to popular taste. The argument goes like this: Instead of telling a “real” Star Trek story, “Spectre of the Gun” gives audiences a half-baked Western, just like everything else on the tube! What a desperate attempt to be popular! Well, it concerns the episode’s unusual choice in visualization. Basically, this argument is that the episode looks cheap and slapdash. But today, I wish to offer an alternative point-of-view. I will argue that this episode is actually one of the most visually-accomplished and stylish ventures in the entire Star Trek catalog. It is true that the town is represented only by pieces of architecture -- some of which float in mid-air -- but such an abstract or surreal visualization is perfectly in keeping with the episode’s themes. The Melkotians are xenophobes and telepaths who are afraid of aliens. When they probe Kirk’s mind, they don’t glean an accurate, complete picture of the Old West, only bits and pieces. Whether this is because Kirk’s understanding of the era are spotty, or because Melkotian psionic abilities are limited is entirely inconsequential, and immaterial. The Melkotians create a town out of Kirk’s half-understood or half-complete memories, and that’s what we see. Thus, the episode’s form absolutely mirrors its content. And that form gives us an opportunity to understand, visually, the unreality of this version of Tombstone. 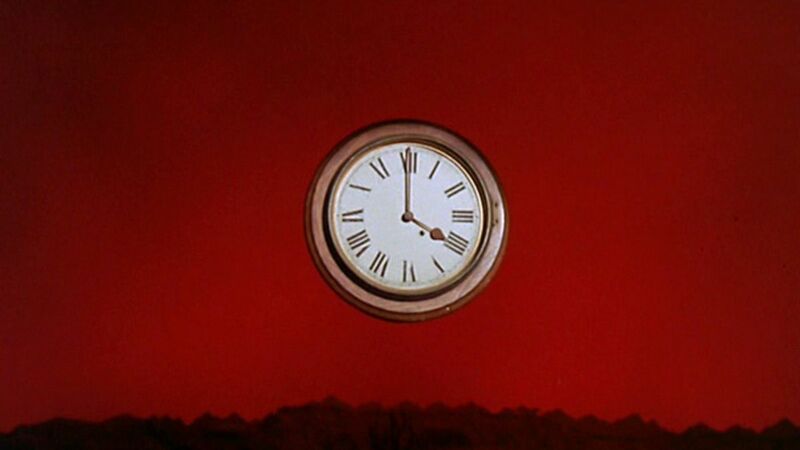 It also permits for highly dramatic moments, such as the ticking down of a clock….floating in mid-air. A “real” set couldn’t highlight the clock, or the deadline to the gunfight, in the same effective manner. We can see how this visual approach is utilized throughout the episode to give “Spectre of the Gun” a nightmarish quality. 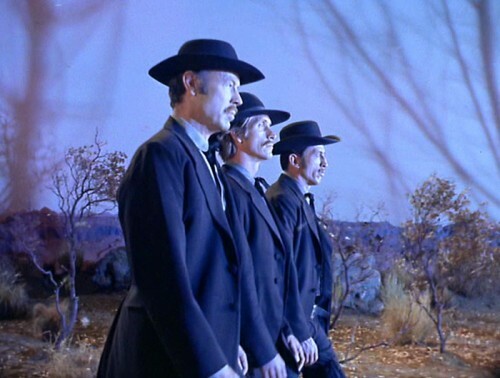 Significantly, the Earps and Doc Holiday are visualized not as standard TV cowboys, but rather as soulless automatons or zombies, stuck in a “groove” that will lead them, no matter what, to kill Kirk and company. They are expressionless beings, shot from low-angles, so as to enhance their menace. Why is this an effective approach? The Earps are not people. They are not “real” or accurate in an “historical” sense. They are ciphers meant to represent death, created by the Melkotians to murder the Enterprise landing party. They cannot be reasoned with, or bargained with. They are soulless executioners. 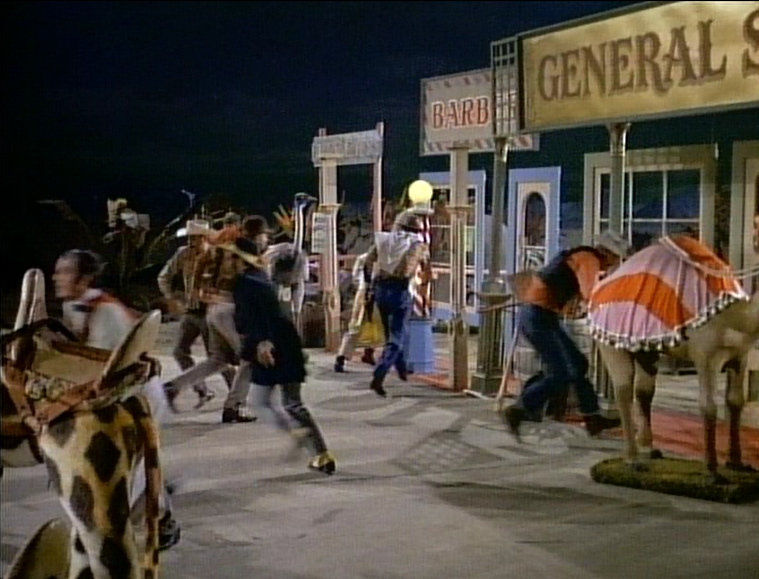 As the Earps march, lock-step towards the OK Corral, the episode provides several expressionistic views of these ghouls, lightning flares reflected on their inexpressive faces. We see craggy tree branches casting shadows on the canvas sky of the sound stage, and again, we’re asked to reckon with a world that is not real, but unreal. It is a half-formed, bizarre, and dangerous terrain. Another terrific shot immediately follows Chekov’s murder. The other landing party members rush to his side, and they appear tiny in the frame. In the foreground on both sides -- visually surrounding them -- are the Earps. 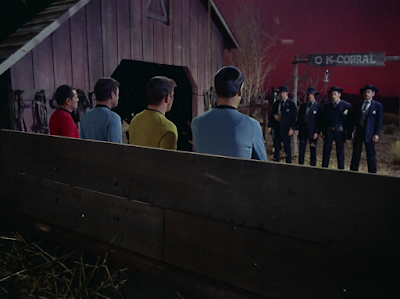 The careful positioning of the Earps in the frame reveals their out-sized menace to Kirk and his friends. Their positioning on both sides of the frame also carefully limits Kirk and company’s available space in said composition. The imagery tells us that our heroes are boxed in. The expressive nature of the filmmaking here creates an absolutely relentless sense of menace. In Star Trek, well-reasoned plans of escape don’t often fail so dramatically. Why? Kirk is resourceful, Spock is logical. Scotty can fix anything. And Bones is the voice of human morality. Working in unison, this team can extract itself from virtually any dangerous situation. Here, because the scenario is surreal -- like a dream -- there is no clear path to escape until Spock understands the “unreality” of the situation. Spock’s realization that the Melkotians have bent reality to their liking is the key that allows him to bend reality too. 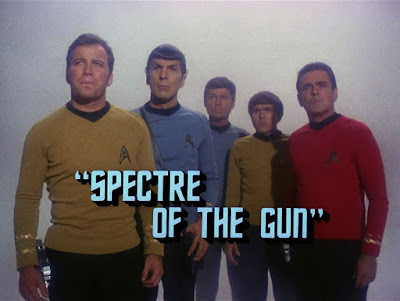 “Spectre of the Gun’s” overriding theme that the power of the mind ultimately beats out of the power of the gun (or belief in a gun, as the case may be) is a terrific one in terms of Star Trek history and philosophy too. 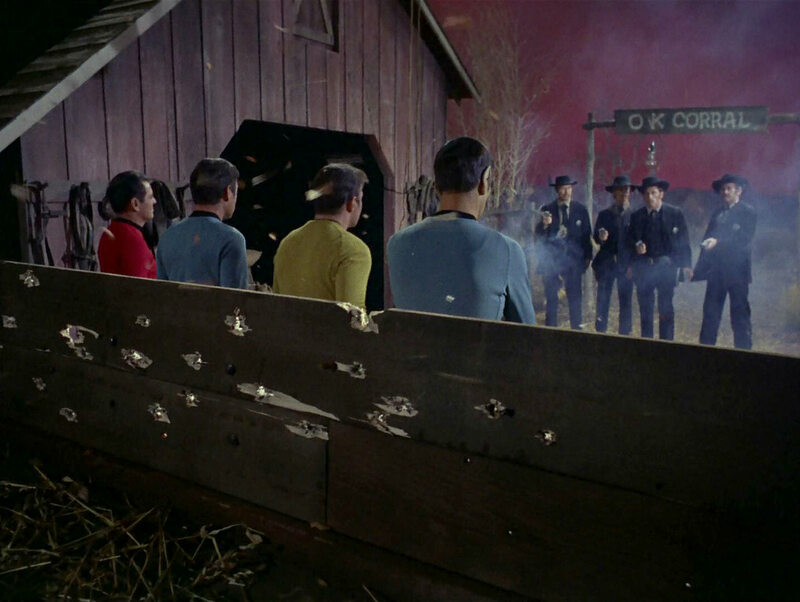 The Melkotians “choose” the gunfight at OK Corral as the setting for Kirk’s execution, but this episode’s events, and Spock’s dedication to reason, prove that man has evolved beyond such violent outcomes by the 23rd century. A positive outcome can be created not through violence (as it was during the gunfight in 19th century America), but through adherence to facts, science, and logic. Kirk successfully wrestles his violent instincts here -- his anger at Chekov’s murder, namely -- and chooses not to kill. He does not live down to the Melkotian’s expectations of a lowly human. Buttressed by that strong thematic line, and its daring, unnerving, expressive photography, “Spectre of the Gun” is an entertaining and thoughtful addition to the Star Trek canon, and a real highlight of the final season. I wish it were more appreciated. John, great review of “Spectre of the Gun”. I like your reasoning for the sound stage interior partial Tombstone sets being used. Sadly, the limited budget on this episode in '68 caused these partial interior sound stage western town street sets as was the case in '66 Lost In Space "West Of Mars" episode. For myself, I would have loved this episode, if they had actually used one of the many exterior western street locations available in the late '60s. When I just checked in, I thought "Oh boy, here comes another thrashing of Spectre Of The Gun". How surprised I was to find another individual who thinks this isn't just one of the best episodes of Trek's third season but one of the best and most imaginative Trek's ever broadcast. I always liked the episode but when I recently rematched it, I was reminded just how brilliant this episode was. I won't rehash your wonderful review but let me say that I agree with it entirely. The shots of the bullets passing through the Enterprise crew yet destroying the fence behind them made a huge impression on me as a kid and continues to thrill me to this day. It both reinforced the dream-like quality of the episode and showed how thrilling a simple stage effect could be. Thank you very this wonderful review! You are quite right about the design work. It is outstanding! The look matches the themes of the script. It would have been cheaper to shoot on a backlot. The approach the Trek crew took was a conscious one. "Spectre of the Gun" features terrific character moments; which aim for, as you state, best-of status. One of my favorite episodes... but I LOVE Westerns. Kirk's continuing attempts to find a way to not die at the OK Corral is always contextualized in terms of finding a non-violent solution to the problem. He never tries to kill or harm the Earps/Holliday prior to the gunfight. Instead, he attempts to leave unreal Tombstone, de-escalates the potential shootout in the saloon, appeals to the unreal Sheriff for assistance, and has his crew build a tranquilizer. Thus, when Kirk chooses not to kill at the end, the Melkotians can see the fulfillment of repeated, consistent, and clear choices Kirk and his crew make to avoid violence (with the exception of Chekov defending Sylvia - but crucially not attempting to kill unreal Morgan Earp in the process), and not to kill even when presented with the opportunity and motive. I don't know, John--my impression has always been that, while it wouldn't make anybody's Top Ten, "Specter of the Gun" was not an unpopular episode. Maybe the "con" voices of a few were just louder the "pro" voices were. Or, more likely, some Grand Poohbah self-important Big Name Fans with delusions of academic grandeur made people feel stupid for liking this episode. This may have been linked to the increase in non-U.S. conventions and attendees from markets where Star Trek episodes were censored or withheld for many years. Germany never aired "Patterns of Force"; the BBC withheld "The Empath" and "Plato's Stepchildren" among others in the U.K.; "Let That Be Your Last Battlefield" was withheld in several countries. 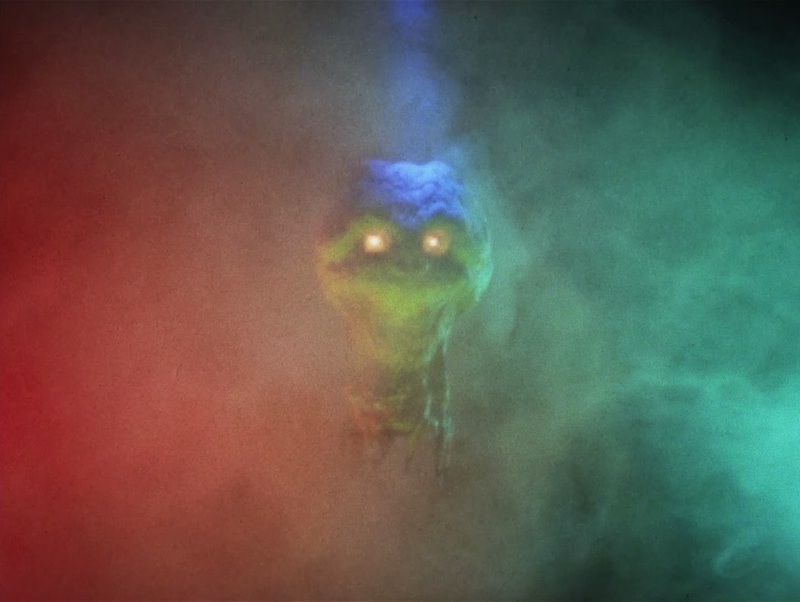 One can see how viewers would have regarded "Specter of the Gun" as extremely bizarre without the similarly stylized, abstract and philosophical episodes like "The Empath" as a frame of reference. When Sci-Fi Channel several years back aired Star Trek as a series of specials interspersed with interviews and hosted by Shatner and Nimoy, it seemed clear from the interviews and some fan polling that there was a lot of affection for this episode. I just remember being vividly impressed as a kid by the bleeding-color, the stylized starkness of "Specter of the Gun": the way the austere scenery-flat edifices emphasize the windblown desolation of empty street, the way the grim faces and wordless stoicism of the Earps emphasize the inexorability of approaching confrontation, the way the cast remaining in Enterprise uniform with gunbelts heightens our awareness that what the townpeople see and react to is not what IS--and yet the crew are powerless to change what must happen. I don't think there was an episode of television in 30 years so memorably and visually impressive! Many fans were raised on reruns of Lost in Space followed by reruns of Star Trek, so the set simularities with LIS's "West of Mars" is what stuck in the minds of many. The two shows couldn't be more different in tone. At no time in "West of Mars" was there any real sense of danger...just buffoonery. Production-wise, many 3rd season eps also feature slicker editing and music. The tree shadows on the sky backdrop are a jarring letdown, just as they were in the Lost in Space episode "The Anti-Matter Man". Agreed on all counts. "Spectre of the Gun" was effective and always captured my younger self's attention. In addition to the cinematography, the supporting performances really elevate the episode. Not once do we feel that we aren't actually in Tombstone, 1881, although the rest of our senses tell us we can't be. The soundtrack is wonderful. The look of the Melkotians is haunting...is there more to them? Do they even have bodies? Finally, the true spectres of the title: Wyatt Earp and his comrades. They seem neither real nor human, representations of Kirk's fears brought to life. They cannot be reasoned with or talked around. They're shadows in both a physical and metaphorical sense. The nice button at the episode's end is Kirk's reaction to the Melkotians agreeing to welcome the Federation. They went through hell to make contact with this race, and in the end it feels entirely worth the effort. From what I've read, the original intention was to use one of the many Old West backlot sets because they thought it would be inexpensive to shoot. Once they ran the numbers, however, they discovered that it was actually cheaper to build an interior set, albeit a threadbare one. I agree that the indoor set makes perfect sense and creates a greater sense of menace. I think if this had been filmed in black and white, a la The Twilight Zone, the sets and cinematography would have been more effective and fans would have liked it more. The backlot would have been cheaper; little or no construction crew overtime. Some set dressing would have happened on the backlot however. 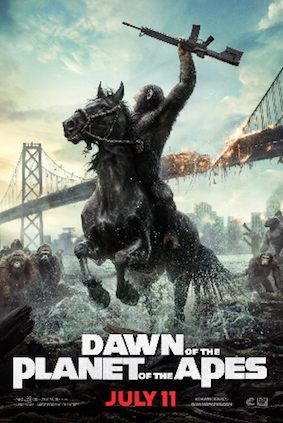 The cinematography, design, visual effects, and music were outstanding. Jerry Fielding was the perfect choice of composer for this episode. 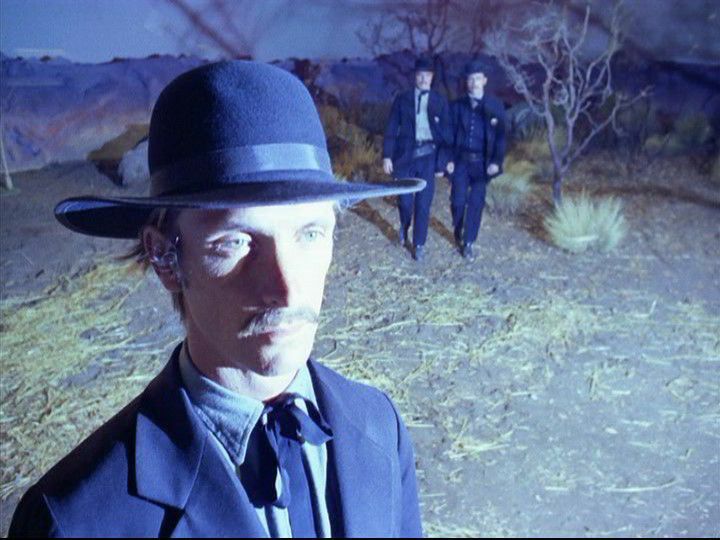 Rex Holman(Morgan Earp) also acted in Star Trek V:Final Frontier(1989) film. This episode has always been one of my favorites, also. Mostly because it is filmed and framed so thoughtfully. I was always amazed anyway at the sophisticated camera angles that were used in Star Trek television episodes, but never so much as they were used here. Even beyond the movie style framing of shots used in Star Trek, the techniques for exploiting space with the camera to indicate scenes portraying alternate realities is something of an evolved method around the time of this episode for television in general, I think. Around this time, I was noticing this trend in other shows like "Lost in Space," "Time Tunnel," "Land of the Giants," and later in "Night Gallery," particularly when trying to convey some other worldly transition or provide the viewer with a significant change in perspective that was intended to visually disturb the senses in the only way available in pre-CGI and special effects eras. In comparison, if you go back to the early "Twilight Zone" episodes where similar alternative reality situations were attempted to be depicted, you would see a more clumsy version of this technique that does not hold up over time and comes off as primitive and less valued now than it was then as a technique to provoke awe rather than amusement. I suppose, in terms of being practical and sensitive to budgets, the background sets were configured in this way on "Spectre" mostly from that aspect, but, I would argue that even so this may have been the case, it was because of these very limitations that were being imposed that gave rise to the impetus for creativity by the photography and art directors left to work with what they had. What came of it was this really beautiful and thought provoking episode that took the regular TV viewer from the late 60's out of their mental viewing boxes of how they expected TV to look and made them see things from a very different point of view. 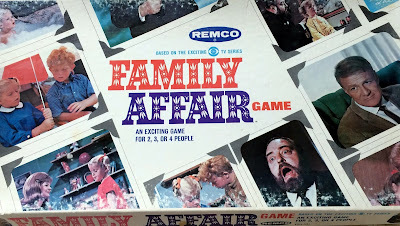 Had the sets just been filmed with normal, standard camera angles which were used on most every show back then on television, it would not have been as impacting as it was when coupled with those bizarre camera shots. Additionally, I would offer that these techniques were evolving along side the drug culture that was becoming more predominant in society and certainly with the younger technical people coming into the business and bringing with them a more advanced and greater inventory of psychedelic experience that was directly applied to their craft. I likes kirks drop kick of wyatt errp near the end!